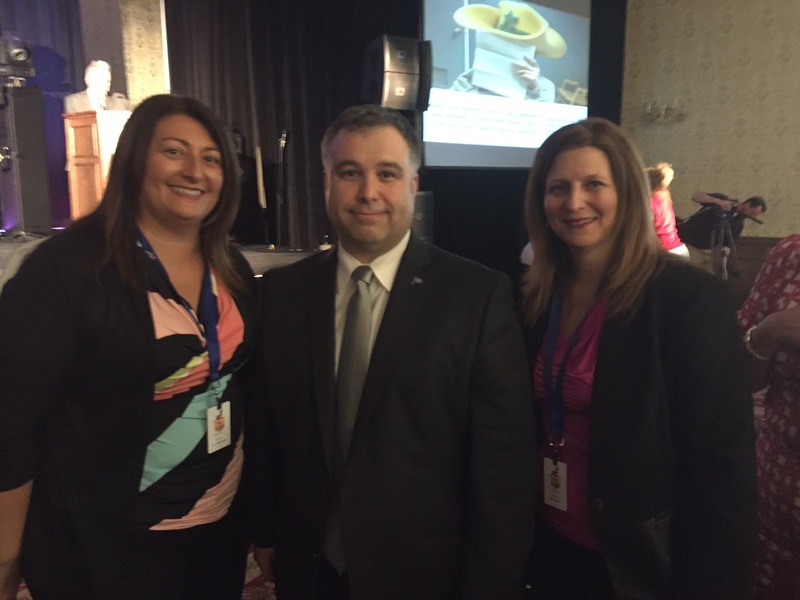 Sylvia Lo Bianco, Sebastien Proulx and Angela Mancini. See this video where Premier Couillard praises English school boards. EMSB PLEASED WITH COURT DECISION: The EMSB is pleased with the decision rendered by Quebec Superior Court Judge Marie-Claude Lalande, who dismissed a request for a Safeguard Order that would have temporarily reversed a decision made by the Council of Commissioners to allow ALL elected Regional Parent Delegates a vote at the Central Parents’ Committee. Three parents, Andrew Ross, David Benoit and Eamon Egan, from a group calling themselves “Parents for a Democratic EMSB,” took the EMSB to court after a much publicized media campaign. The trio, representing themselves, alleged that their rights as elected parent representatives had been infringed upon by the board and undertook to prove as much by asking for the Superior Court of Quebec for a Safeguard Order. “I am very pleased with the court’s decision” said Chairman Mancini. “The Council would never have made the change to the structure of the Central Parents’ Committee had a significant number of parents not asked us to do so. This was a grassroots initiative; and the Council demonstrated its support for ALL parents and for the fundamental democratic premise of: one school – one delegate – one vote.” Joanne Charron, a Parent Commissioner representing the Advisory Committee on Special Education Services (ACSES), also expressed her delight with the verdict. “I hope this is final.There are so many great things going on in our EMSB schools. It’s time to focus on building for the future.” See the press release. IN-SCHOOL ADMINISTRATORS: Some more in-school administrator appointments and changes have been announced for 2016-201. Retiring as principals will be Leah Auclair (presently on leave at Edinburgh Elementary); Raizel Candib (Merton); Marysa Barassi (St. Laurent Adult Education Centre), Claude Dansereau (LaurenHill Academy) and Ben Fagan (High School of Montreal Adult Education Centre). SCHOLARSHIP TO STUDY IN ISRAEL: Ramin Khodaie, the coordinator of the International Baccalaureate Program at Marymount Academy International in NDG and Clearpoint Elementary School in Pointe Claire, Lester B. Pearson School teacher Suzanne Ujvari, have been chosen as winners of the Riva and Thomas O. Hecht Scholarship, Teaching of The Holocaust for Educators for a three week experience at the Yad Vashem Holocaust Memorial in Israel this summer. This is the 11th year of the project and over that time a number of EMSB teachers have travelled to Israel and returned with interesting options for their respective curricula. Mr. Khodaie and other recipients will be formally awarded their all-expenses paid experience at an orientation and dinner on June 1. The teachers will take part in a professional development program under the direction of the Faculty of the Yad Vashem Seminars for Educators from Abroad, International School for Holocaust Studies. The goal of the program is to provide professional development activities to teachers for teaching about the Holocaust and anti-Semitism. Each scholarship recipient will be asked to create at least one teaching unit or module developed within the context learned, appropriate for the régime pedagogique. Ramin Khodaie (fifth from left) accepts a gift from Riva and Thomas Hecht. Left to right, Angelo Marino, Ann Marie Matheson, Angela Mancini, Elizabeth Lagodich and Pela Nickoletopoulos. MARYMOUNT RECOGNIZED: Marymount Academy International has been recognized as Leading MYP eAssessment School. Since the early days of formal education, assessment by paper and pen has been the tool to measure knowledge and understanding of the taught curriculum. As a leader in international education, International Baccalaureate is committed to preparing students for the challenges of today’s world. IB programs assess understanding and skills that go beyond memorizing facts and figures. IB, a pioneer in education, has introduced an assessment model for year five students that goes beyond traditional examinations. Students work on their on-screen exams. IB has developed on-screen examinations where students sit in front of their computers, and answer questions for mathematics, language and literature, individuals and societies, sciences and interdisciplinary subjects. "We believe this approach to examinations will spread to different institution and very soon all students will be taking exams in this form," says Mr. Khodaie. "Currently students from across the world appear for these exams on the same day and we at Marymount Academy International are proud to be part of this progress. This year for the first time our students are appearing for the on-screen exams and we were given the Leading eAssessment School badge by the International Baccalaureate Organization. summer's "Camp de Blues," after passing an audition. They will be placed into a band and receive one free week of music camp given by professionals and end off by performing at the Montreal International Jazz Festival on Saturday July 9 (6 pm) on the Main TD stage. Congratulations to these students as being the first ever to represent Royal Vale School in music at the Montreal Jazz Festival. NATIONAL TEACHERS' DAY: On the occasion of National Teachers’ Day, which occurred on May 3, the EMSB recognized two teachers with special awards from P.F. Chang`s while La Cage Brasserie Sportive did so for a physical education and health teacher. The ceremony took place at St. Monica Elementary School in NDG. City’s Breakfast TV was there and provided this exceptional coverage. Teachers Stéphane Fortin, Nancy Girard and Genevieve Kona-Mancini accept their awards. 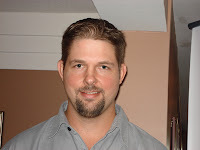 Christopher Hawkins, a manager for the P.F. Chang’s location on Rue des Jockeys near Decarie Boulevard and Jean Talon, presented St. Monica teacher Nancy Girard and Shadd Health and Business Centre instructor Genevieve Kona-Mancini from the Pharmacy Technical Assistance Program, with $100 gift cards to the popular restaurant known across the globe for its fabulous Asian cuisine. Genevieve is the daughter of former EMSB teacher Tony Mancini. Stéphane Fortin, the physical education teacher at Elizabeth Ballantyne Elementary School in Montreal West, received a $100 gift card to La Cage Brasserie Sportive. Professional boxers Ulysse Junior and David Theroux, ambassadors for La Cage, presented that award. EMSB Commissioner Joseph Lalla was on hand as well. Nancy Girard has been a teacher for 16 years. Since 2009 she has taught French to Cycle I students at St. Monica. Ms. Girard who is known for her smiling personality, calm manner and the happiness she brings to her students, says she was surprised and moved when she found out she was being honoured on National Teachers’ Day. Genevieve Kona-Mancini started her teaching career nearly four years ago at the Shadd Health & Business Centre’s Pharmacy Technical Assistance Program. One of her major strengths is to help students develop not only within the Pharmacy Technical Assistance Program, but also reach out to the students who are involved in the vocational school’s other programs. 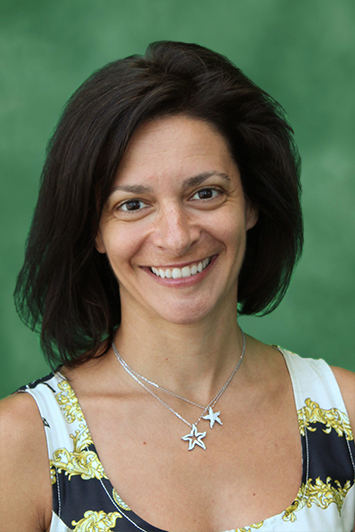 “She is able to lead students beyond the trade, and helps make them become successful employees in the community,” said Shadd Vice-Principal Maria Caldarella. Stephane Fortin has spent 26 of his 28 years as a teacher at Elizabeth Ballantyne School in Montreal West, where he teaches physical education and French to its students from Grades 1 to 6.“Being a teacher is not an easy job, but it’s very nice to be recognized on a national level,” said Mr. Fortin. 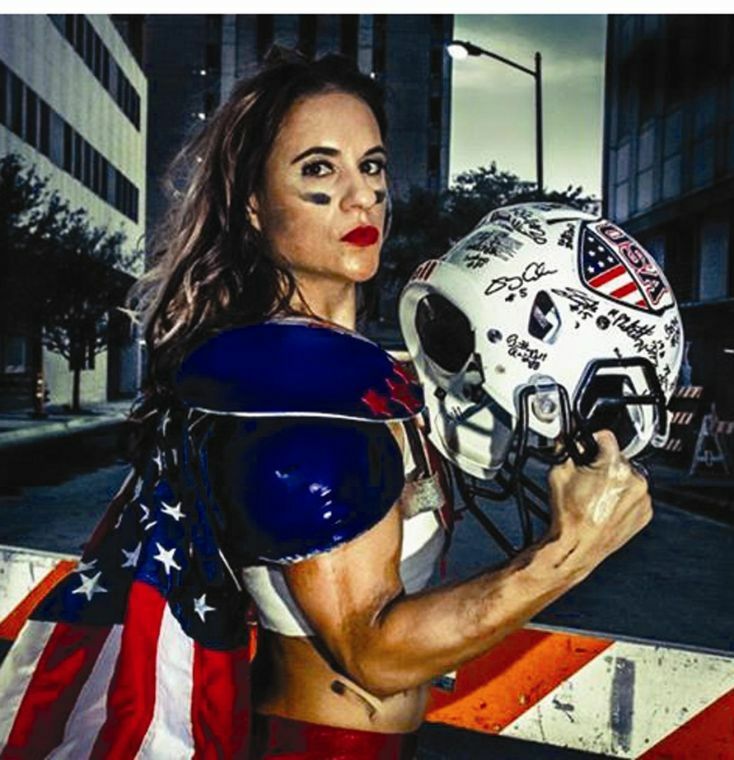 “I still love my job and I love being with the kids to teach them sports and different kinds of skills. It makes me very happy to put on my and the McGill Redmen, for whom he also served as goalie coach for many years. See the press release. See our video. GENDER-NEUTRAL INITIATIVE: Westmount High School has opened a gender neutral washroom, following up on requests to this effect that were made to Principal Michael Cristofaro. Last year it was brought to the administration’s attention that a number of students were uncomfortable using the washrooms because of gender identity issues. Given these comments, a survey was conducted with the student body about their level of comfort regarding a gender neutral washroom and approximately 80 percent said they supported the notion or were indifferent to the concept. With this in mind, the school moved forward with consultation and discussions at different levels, including the teachers, Governing Board and School Board. Celebrating the launch of the Gender-Neutral washroom. Given what has been positively happening in other school jurisdictions, the decision was made to move forward with a pilot project where one of the girls’ washrooms would be transformed into a gender-neutral washroom. 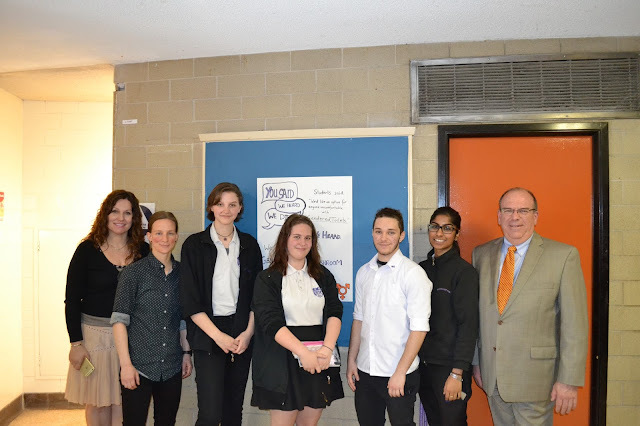 TRANSGENDER WORKSHOP: On May 5, the Student Services Department of the EMSB held a workshop for in-school administrators on the subject of “Transgender/Gender Non-conforming Children” at 6000 Fielding Avenue. The animators were Kimberly Manning, Associate Professor of Political Science (Concordia University) and Akiko Asano, co-founder and President of Gender Creative Kids Canada. Both are parents of transgender children. GAY-STRAIGHT CLUB AT PEARSON: Lester B. Pearson High School’s (LBPHS) trailblazing Gay-Straight Alliance (GSA) honoured International Day against Homophobia and Transphobia by launching their official Lester B. Pearson Safe-Space logo. The Safe-Space logo launch took place on May 18, in the plaza of the Montreal North high school, with nearly 100 LBPHS students, staff, and alumni in attendance. The logo was unveiled by student Melissa, to great applause. Guidance Counsellor Natasha Krsteski and Principal Carmen Nicholas with students. The purpose of the Safe-Space logo is to identify and educate individuals who will affirm and support all persons, regardless of sexual orientation and gender identity. Stickers with the logo will be distributed to staff members to display in or outside of their classrooms or office spaces. The logo was inspired by the universal sign of safety, diversity and acceptance, and has been embraced by the LBPHS community. Carmen Nicholas, principal of LBPHS, addressed attendees: “Our priority is to have a safe and caring school environment that promotes equity and diversity for all. Today is another demonstration of the strength of our community. It is a place where everyone has equal opportunity and access to learning.” See the press release. Grade 6, answering questions and engaging in an interactive creative writing workshop, taking students through the conception of an idea and describing how a concept eventually makes it to print. Stevenson also delved into the personal inspiration for her latest book, Pride, which is only one of a handful of children’s books to feature LGBTQ families. MENTAL HEALTH WEEK: The Mental Health Resource Centre of the Student Services Department challenged our schools to take a few minutes to connect in a positive, inspiring, and motivating way with others. The EMSB responded. Grade 9/10 students from John F. Kennedy, LaurenHill Academy, Marymount, Mile End, and Vezina sent out messages of encouragement to grade 5/6 students at Cedarcrest, Coronation, East Hill, Edinburgh, Hampstead, John Caboto Academy, and St. Gabriel. Further to that, James Lyng, Laurier Macdonald, and Rosemount High School responded in other ways. At all of the schools that participated a very positive vibe emerged. Students giving and receiving truly enjoyed the experience. Below are only some of the examples of student reactions. 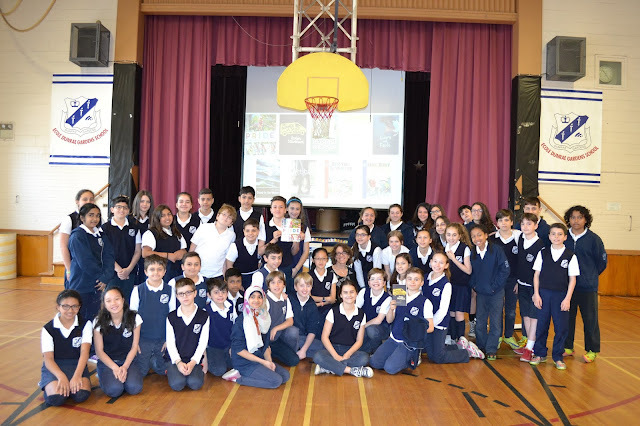 AT EDINBURGH: Grade 5 students beamed as Joseph Monacchino shared “Messages in a bottle” from Marymount Academy International Grade 10 students, with the assistance of Elyssa Feldman, Guidance Counsellor and Linda Luca, Spiritual and Community Animator. 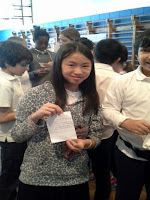 The children were sincerely touched that older students took time to send them messages of encouragement. They all wanted to read their messages out loud in the class and reflected how these special notes made them feel good and “not alone.” It was a heartwarming and touching time in that class. AT CEDARCREST AND LAURENHILL: “The Grade 6 students at Cedarcrest Elementary School were thrilled to receive messages from LaurenHill Academy high school students. We had a wonderful dialogue about what mental/ emotional wellness means and what we can do to reduce stress in our daily lives. I read some of the letters, they were well written, sincere and heartfelt,” said Mary Poullas, Spiritual and Community Animator. 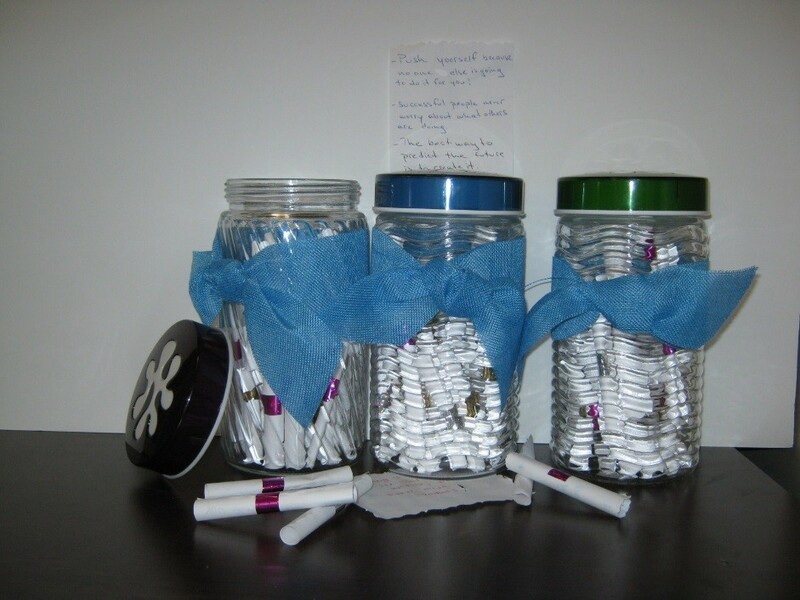 AT JAMES LYNG HIGH: "The guidance counsellor, Stephanie Kaplan, and I took the five minute challenge to heart and decided to give a special envelope containing a motivational quote and message to all the Secondary V students at James Lyng High School. Seeing that they are in their last year and now entering exams, we felt it was a nice gesture to give them a little boost of confidence and encouragement to reach their goals," said Veronica D'Agata, Spiritual and Community Involvement Animator. AT ROSEMOUNT HIGH: During Mental Health Awareness Week at Rosemount High School students signed up for a different wellness activity every day of that week. Students participated in a yoga class, dance party, zumba class, art therapy, mandala & zentagle day, and a nature walk. Also Mr. Mayard, science teacher at Rosemount High School, took up the 5ive minute challenge and asked his Secondary V students to write inspirational quotes to his Secondary 1 students, reports guidance counsellor Jamie Dimopoulos. AT JOHN F. KENNEDY HIGH: Students were happy and eager to participate during Mental Health Awareness Week. J.F.K. Secondary IV students participated in an activity called The Wellness Wheel, followed by another activity “Message in A Bottle.”J.F.K. students wrote inspirational quotes/words of wisdom to East Hill Elementary School students about high school experience and life in general. Word then got out to the rest of students and staff at JFK. "We filled our bottles to capacity with love and inspiration. In fact, J.F.K. high school students enjoyed this activity so much that they pleaded for us to bring it back to them next year," said Betty Stamatakos, Guidance Counsellor. AT LAURIER MACDONALD HIGH SCHOOL: Isabella Ricci, a Laurier Macdonald student, lead an .initiative to spread awareness of mental health and mental illness. She organized activities for homeroom classes to go over, with a new theme pertaining to mental health awareness every week. She also sold lollipops at lunch, every day, for 50 cents, with the proceeds going to the Montreal branch of the Canadian Mental Health Association. She hopes to raise one thousand dollars by the end of the month. Students and staff from Laurier Macdonald walked into a nice surprise on May 4. Genia Palechka and Brianna Molino, Grade 10 students, left post-it notes with inspirational quotes around the school. It was a student-led initiative. “We wanted to spread positivity around the school,” said Brianna. Added Genia: “Our goal was to inspire all the students that you don’t have to do something nice just for marks." It was a great way to start off the day on a good note. HELPING FORT McMURRAY: Dollar by dollar, Grade 10 LMAC student Genia Palechka is trying to make a difference. In light of the recent wildfires that destroyed Fort McMurray and left tens of thousands homeless, Genia began a crowdfunding campaign with the immediate goal of helping those in affected as well as with the long-term objective of inspiring her peers to start taking action on global and communal issues. “I would like to help the residents of Fort McMurray in their time of need. They can use a helping hand,” said Genia. “Many people do not take initiative on issues; I would like to inspire the youth to do just that. I would like young people to realize that they can raise awareness of anything, regardless of their age.” To date, Genia’s campaign has raised $195 via donations from the Laurier Macdonald community. Contributions can be made through the following link: https://www.gofundme.com/22z7hys. All monies raised will be donated to the Canadian Red Cross. LMAC IS BUZZING: There is a distinct buzz in the air at Laurier Macdonald High School as it is set to welcome two beehives on May 30. Working alongside Alvéole, a company that promotes urban honeybee colonies, students at Laurier Macdonald will become the first at the EMSB to welcome these new visitors onto school grounds. The two colonies will be installed on the roof of the school, above the main student entrance. Students will be able to monitor the bees from the library, which has a window that will overlook the colonies. In advance of the installation of the beehives, a group of students have been visiting classes to educate their peers on the importance of bees as well as ease any fears regarding their presence. Furthermore, the team from Alvéole will make routine visits to the school to answer questions, ease any concerns and ensure the well -being of the school’s newest tenants. See the press release. LMAC COFFEE HOUSE: Students, family and friends from Laurier Macdonald High School were treated to a unique experience recently. The Spiritual Room was transformed into an intimate coffee house, complete with dimmed lighting, coffee and goodies (baked by their very own students), and a little stage that served up some BIG talent! Audience members were treated to poetry performances that highlighted the deep and moving emotions and stories experienced by the talented teens of Laurier Macdonald. Woven into the night were astounding musical performances, including guitar-playing, solo and duet singing, and even drum solos! A few students were so moved by their peers’ performances, that they bravely came to the microphone to astound the audience with impromptu performances. Teacher Cathy Chevrier, the organizer of the event, said: “Overall, I’m extremely impressed by the students’ level of talent and commitment, as well as the maturity they brought to the event. Everything from the baking, to the ticket sales, to the set-up was completely student-driven, and I couldn’t be more proud of the school community!” The proceeds from the Coffee House went towards purchasing new books for the Montreal Children’s Hospital. A total of $250 was raised! Bravo to the students of Laurier Macdonald! Dora Cesta, Aline Zerounian, Kathy Yates, Marisa Santeusanio, Nicole Orsali and Lorraine Morreault. HEAD OFFICE RETIREMENTS: The EMSB Central Head Office held its annual Denim Day fundraiser for breast cancer research by recognizing several staff members who are retiring: translator Aline Zerounian; assistant director of Student Services Dora Cesta; Nicole Orsali-Bernard from Real Estate; Kathy Yates from Educational and Technology Services; Lorraine Morreault from Material Resources; and Marisa Santeusanio from Registration. Debbie Lancaster from Financial Services was not able to be present. EMSB Director General Ann Marie Matheson presented each of the ladies with bouquets of flowers. Ms. Zerounian, who has worked for the EMSB and the former PSBGM for 52 years, and Ms. Cesta spoke about the importance of supporting breast cancer research. The James Lyng winners are congratulated by Council. PRIX DE COEUR: The Educational and Technology Services Department congratulates teacher Nathan Gage and the students of James Lyng High School in St. Henri for having won the "Prix Coup de Coeur" for their "The Struggle for Black Equality" Entrepreneurship Project, awarded at the 18th Edition of the Entrepreneurial Adventure’s Regional Competition at City Hall in Old Montreal. Honourable mention goes out to EMSB local winners: Nesbitt School “Forget me Knot…or;” Leonardo-Da Vinci “Brain Awareness Project;” Pierre Elliot Trudeau “Loyal Leaders;” John F. Kennedy “Actors Guild;” L.I.N.K.S. “Christmas Cards for ALS;” and “Cultural Mosaic Through Students’ Perspective;” and Perspectives II High School “U Hungry?” Everyone is thrilled to see the involvement of these schools when it comes to the entrepreneurial adventure, supported by the Ministry of Education curriculum. STUDENT LEADERSHIP: A total of 215 students from across the EMSB’s network of high schools returned from the 18th annual School Board Leadership Camp at Camp Val-Estrie in Waterville, QC. This year’s theme was Pangea - just like the primordial continent we can all come together to form something powerful and effective. Students from Secondary I thru V participated in the retreat, coming from James Lyng High School, John F. Kennedy High School, John Paul I High School, LaurenHill Academy, Laurier Macdonald High School, Lester B. Pearson High School, Marymount Academy International, Rosemount High School, Royal Vale High School, Royal West Academy, Vincent Massey Collegiate and Westmount High School. Guest Speaker Harriet Turk addressed the EMSB student leaders in the annual keynote address. Some of her main messages included the following: "One of the most courageous things you'll ever do is to shed that invisible costume and just be you. If you don't know who you are, you can't contribute to your team. There's no power in knowledge until you put it into action. When you make the decision to do great things, that's awesome! Stop concentrating on who you are not, and start focusing on who you can be. If you don't honour and respect yourself, why should anyone else honour and respect you? If you stay comfortable all the time, you cannot grow. Protect your integrity." See the full press release. ACTOR RETURNS: LaurenHill Academy in St. Laurent welcomed back graduate Spiro Malandrakis, who has successfully pursued the career goal he had in high school – to be a professional actor. Drama teacher Chrissy Pappas invited Spiro, 33, to spend six periods with her students on May 9 and 10. He shared his professional and personal journey. On both days, he attended first, second and last periods. Spiro Malandrakis talks to students. Following a major supporting role in the U.S. recently on Discovery’s new series Real Detective, Spiro continues his steady rise to stardom with a recurring role on Bravo TV’s award-winning series 19-2. Over the course of six episodes in this year’s upcoming third season, which begins in June, he joins the talented cast of 19-2 (Jared Keeso, Adrian Holmes) in a game-changing role—both for his career as much as for the show—that’s set to shake up the plot in a major way! Spiro’s role on 19-2 caps off a number of recent appearances such as Real Detective, supporting fellow Canadian Devon Sawa (Final Destination), The Fixer alongside Eric Dane (Grey’s Anatomy), Pawn Sacrifice opposite Tobey Maguire (Spiderman) and ABC’s new series Quantico. Born and raised in St. Laurent, Spiro began acting at the age of 15. Following his first leading role and television debut on MTV’s series Undressed, he landed a supporting role in Going for Broke where he acted alongside Ellen Page and Delta Burke. Prior to his supporting role of Oliver in the cult classic The Wild Hunt, Spiro played leading roles in various theatre productions such as Vittorio Rossi’s Little Blood Brother and John Patrick Shanley’s Savage in Limbo. This multi-talented actor has equally made a name for himself in Montreal’s voice talent community, lending his vocal skills to a multitude of roles for radio and television. Spiro recently starred alongside Matthew Modine (The Dark Knight Rises), as police cadet Tim Davis, in CAT. 8, a doomsday mini-series thriller and in Syfy’s Ascension, starring Tricia Helfner (Battlestar Galactica), portraying the recurring role of Nixon. OPERATION BEAUTIFUL: The LaurenHill Junior Girls Club is featured on the Operation Beautiful website. (www.operationbeautiful.com). Last March, physical education teacher Julie Ramundo and 12 girls set up the North American initiative called "Operation Beautiful" in the girls main bathroom. Over 250 post it notes were placed in the washroom at lunch time. 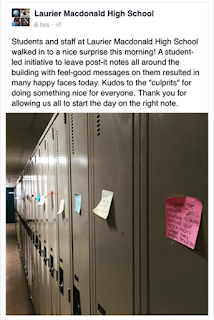 Females were encouraged to go to bathroom and take whatever post it note called to them. The project was a great success! The LHA girls club plan to participate in “Locks of Love" next year whereby a good number of girls will cut and donate their hair to create wigs for girls undergoing cancer treatments! Pierre de Coubertin students jump rope. 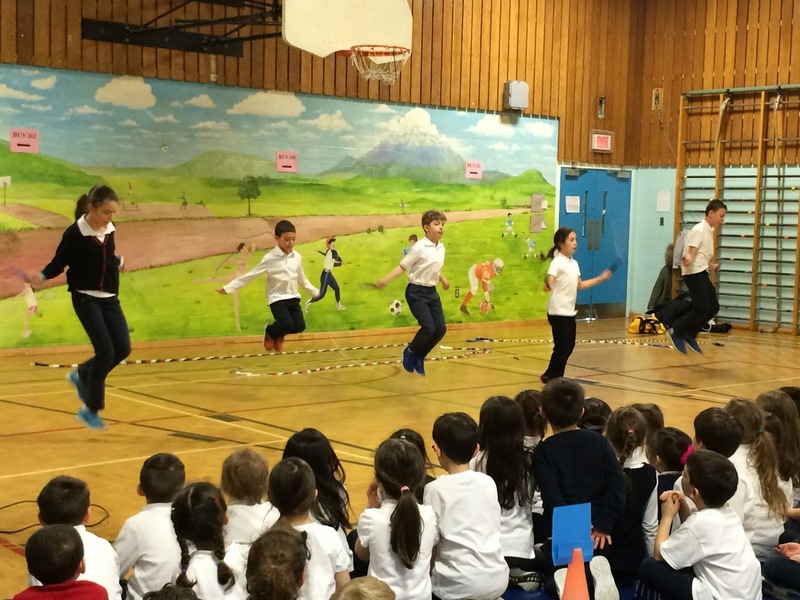 JUMP ROPE AT COUBERTIN: On April 26, Pierre de Coubertin Elementary School in St. Léonard had its second annual Jump Rope for Heart event, which culminated in a whole day of indoor and outdoor skipping activities, organized by our physical education teachers. Students raised over $11,300 for the Heart and Stroke Foundation of Canada. WASTE-FREE LUNCHBOX DAY: Students at Pierre de Coubertin had a Waste-Free Lunchbox day recently. They were asked to pack their lunch using reusable containers, utensils and cloth napkins. The event was such a success that the Green Team decided to go one step further and start composting. The Green Team members are not only making sure the students are composting the right things, they are also teaching them what different things can be composted. The 70 greeting cards of various sizes – which were produced by a number of groups that were made up of the school’s entire student population -- were presented to the child refugees by two Westmount Park student representatives, Grade 6 students Victoria Lee and Colin Pasian-Rozahegy. Colin told the group of young refuges about what Canadian school life is all about, and how the student population comes from diverse multi-cultural backgrounds, while Victoria related her story of how she arrived in Canada from her native South Korea at the age of 8 not knowing how to speak English or French, and assured them that Canada is a safe and happy place to live. See the press release. 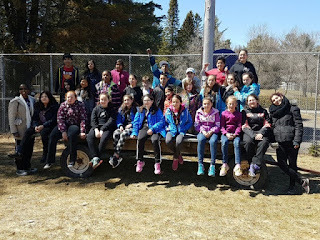 BILINGUAL COMIC STRIP: At Westmount Park, Ms. Anna’s and Ms. Sabrina’s Grade 6 students collaborated with Grade 6 students from École Marie Anne Gaboury in Winnipeg, Alberta on the creation of a bilingual comic strip. Based on the theme of Linguistic Duality, the bilingual comic strip entitled “Like Cats and Dogs,” highlights the similarities between Francophone and Anglophone students. This comic strip was part of an exhibition that was shown during the Blue Metropolis Festival in Winnipeg, Alberta from April 11 to 17. A replica of this exhibition is now at Espace Lafontaine (in Lafontaine Park, in Montreal) for the entire month of May. Following its tenure at Espace Lafontaine, the exhibition will be at the Comic Strip Festival taking place from May 27 to 29 in Montreal. A book featuring the comic strip will also be published. St. Gabriel Elementary School is congratulated. GREEN AWARDS: For the fifth consecutive year, the EMSB has handed out Green Awards and grants to different schools, this time worth $30,250. The EMSB Green Plan Committee received and reviewed many submissions which reflected the Green Action Plan of various schools. The aim here is to help schools, centres, and the Administration Building implement and fund future environmental initiatives ensuing from their action plans. “The EMSB would like to congratulate all the schools that continue to demonstrate their dedication and creative abilities in an effort to remain environmentally conscious,” stated EMSB Chairman Angela Mancini. Please see the full press release. Here is the photo album from the awards presentation. GREEN CLUB: EMSB Green Club students had a fun time with with Breakfast Television earlier this month. Host Catherine Verdon Diamond caught up with Frankie Flowers at Gerald McShane Elementary School in Montreal North. Together they taught the kids gardening basics. Honoured staff gather for a group photo. LONG SERVICE RECEPTION: About 82 people attended the annual Long Service Reception, which took place on Tuesday, May 10 at the Le Challenger reception hall in St. Laurent. The EMSB honoured 36 employees – ranging from teachers, administrators and support staff - for their 25 years of service with the Board, which began in 1991. EMSB Chairman Angela Mancini, Director General Ann Marie Matheson, Deputy Director General Angelo Marino, along with several commissioners, school administrators and the directors from the Regional Office, School Organization, Adult Education and Vocational Services, the Administration Building, Student Services, Material Resources and Human Resources, presented the honoured employees with special 25 years EMSB Monarch watches as a token of appreciation. The honourees who were present this year were Evelyn Alfonsi (Regional Director); Donald Allen (Security Officer, Material Resources); Georgette Amar and Santina Miceli (Galileo Adult Education Centre); Mario Argiropoulos, Daniela Borzacchini, Hariett Cohen and Naomi Goltzman (Adult Education and Vocational Services); Marysa Barassi, Suzanne Lanthier and Angela Soda-Bozzer (St. Laurent Adult Education Centre); Metaxia Daras-Tsopeis (Carlyle School); Miria Fent and Nicole Mahoney (John F. Kennedy Business & Health Centre); Christiane Gagné and Elizabeth Gluch (Marymount Adult Education Centre); Nicoletta Gouskos (Human Resources); Nick Katalifos (Roslyn School); Jeanine Lason (School Organization); Joanne Lipscombe, Iliana Panova and John Vaccarella (High School of Montreal Adult Centre); Brigitte Martin (Honoré Mercier School); Gina Milazzo (General Vanier School); Eddy Nolan (Mountainview School); Pasquale Pietrantonio (Options School); and Lori Rubin (Student Services). Students focus on their robotics project. JUNIOR ROBOTICS: It was a virtual sweep by the EMSB as teams representing 10 EMSB elementary and high schools won 21 out of 24 awards at the 14th annual Junior Robotics Competition, which took place on April 29 and 30 at Vanier College in St. Laurent. The competition, which was organized by the Educational Alliance for Science and Technology (E.A.S.T. ), saw more than 300 student participants who represented a total of 17 elementary and high schools, and formed 75 teams. Throughout the two-day event, the student teams were asked to build and program robots, in order to meet a specific challenge that was designed especially for the competition in an environment that encouraged motivation, programming, fun, and team building skills. There were four categories that the students competed in: Soccer, Search and Rescue, On Stage (Dance) and Triathlon.At the awards ceremony, which was hosted by Global TV news anchor and reporter Elysia Bryan-Baynes, Royal West Academy in Montreal West won a total of six awards; Merton School, four; Gardenview in St. Laurent, General Vanier in St. Léonard, and Vincent Massey Collegiate in Rosemount, two; and Cedarcrest, Edinburgh, Focus High School in NDG and Royal Vale Elementary in NDG, one. Other EMSB schools whose students participated in the 14th Junior Robotics Competition included Bancroft, Dalkeith, and St. Dorothy. Also competing were Riverdale High School, Dorval Elementary and Margaret Manson Elementary from the Lester B. Pearson School Board, and Selwyn House, which represented the private school sector. Nijad Dahdah, an engineer by profession whose children went to the EMSB, coordinated the event. See press release. Here is the photo album. Sinclair Laird shares the LOVE. SUMMER SCHOOL: The 2016 EMSB Summer School Program at the EMSB will once again be based at John F. Kennedy High School in St. Michel. Last year the centre enrolled 537 students who registered for a total of 621 courses. Nineteen teachers were employed. The purpose of the Secondary Cycle I (Secondary I and Secondary II) Summer School is to provide continued support for students in Secondary I in English, French and/or Mathematics. It will also allow those students in Secondary II the extra time and opportunity to attain the level of competency necessary to be promoted to Secondary Cycle II (Secondary III). The purpose of the Secondary Summer School is to provide a review in the course(s) for which students meet the admission requirement of a June mark between 50 and 59 percent. Students in Secondary I, II or III who succeed in their summer school studies are permitted to advance to the next level of the course. Information regarding Summer School 2016 is available on the EMSB website. THE BRAIN SCIENCE OF ADOLESCENCE: A team of EMSB in-school administrators, Student Services Department professionals, Education and Technology Services Assistant Directors Athina Galanogeorgos and Darlene Kehyayan and East and West Sector Regional Directors Anna Villalta and Pela Nickoletopoulos attended an all-day ground-breaking conference event and interactive presentation with Dr. Laurence Steinberg. Sponsored by OMETZ, it took place at the Shaare Zion Congregation on Côte St. Luc Road. Dr. Steinberg’s presentation emphasized the brain science of adolescence, specifically on how “They think different: Lessons from the new science of adolescence.” Dr. Steinberg is one of the world’s leading experts on adolescent development and author of approximately 400 articles, essays and 17 books. He has been featured on numerous television programs including CBS Morning News, Today, Good Morning America, 20/20, Dateline, PBS News Hour and the Oprah Winfrey Show. 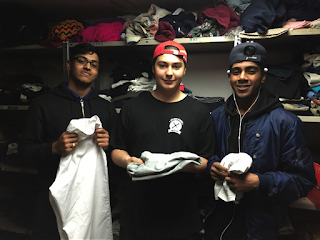 JFK students get down to business. TRUE COLOUR RUNS: Students at John F. Kennedy High School in St. Michel and John Caboto Academy in Ahuntsic decided to lace up their shoes and hold two True Colour Runs, benefiting Free the Children and the victims of the Fort McMurray fire, respectively. John F. Kennedy High School hosted their True Colour Run on May 12. John Caboto Academy (8955 Meunier) will do theirs on Tuesday, June 14 (12:30 pm). The unique events have two common goals: celebrating the community and supporting a worthy cause. Throughout the race, participants will be covered in different colours at five-minute intervals. Runners will also be surrounded by a festive atmosphere of music and dancing. At the culmination of the event, all the participants join together for a massive colour throw, which creates a spectacular colour cloud. RADIO CANADA AT PET: The popular Radio Canada program Transformatruc filmed an episode at Pierre Elliott Trudeau Elementary School. Students joined host Tristan in decorating a stairway with beautiful drawings of animals. Host Tristan Demers visits many elementary schools throughout the year and helps beautify parts of the respective buildings with a dose of humour and imagination. You can see a clip here. Harry Ship is greeted by students. 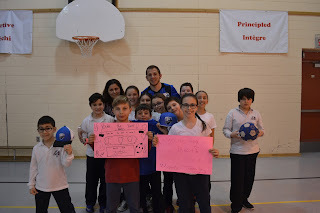 EMSB AND THE IMPACT: For the 11th year in a row, the EMSB is pleased to announce the continuation of a partnership with the Montreal Impact soccer team through its “All the Way with the Impact” program. Over the next few months, members of the Impact will be visiting schools to remind young students of the importance of studying, persevering and building self-confidence in order to succeed. Harry Ship visited Michelangelo Elementary School in RDP. Here are the photos. The traditional “EMSB Night will take place on Wednesday evening, June 8, at Saputo Stadium as part of the Amway Canadian Championship, which involves the top five professional clubs in Canada, in the race to qualify for the CONCACAF Champions League. That is an international competition between professional clubs from North America, Central America and the Caribbean. Tickets, which are usually $20 each, are priced for EMSB families at a discounted $13 each. Some of the proceeds from ticket sales will go towards Inspirations, a publication dedicated to the special needs community. We will accept orders on a first-come, first-serve basis from the schools and there is an option to purchase tickets safely and securely via credit card. To do so online, please visit www.emsb.qc.ca/impact. Two students will also win $500 Tony Licursi Scholarships. See the video from last year’s game. ALOUETTES NIGHT: There will be a special EMSB Night at the Montreal Alouettes pre-season game on Thursday, June 30 at McGill’s Molson Stadium when the Ottawa RedBlacks are the visitors. This is an individual school fundraiser. So for every ticket sold at a strongly discounted rate of $15, schools get to retain $2 for their own fundraising purposes. E-mail communications@emsb.qc.ca to sign up. MONTREAL COMICON: The EMSB will have an information table at Montreal Comiccon July 8 to 10, at the Palais des Congrés. More details to follow. SPIRIT QUEST: Similar to their high school peers, students at Edward Murphy School in Hochelaga-Maisonneuve recently embarked on their own Spirit Quest, allowing them to get in touch with their inner selves. Organized by Spiritual and Community Animator Rocco Speranza, the spiritual journey took them through their school community and neighbourhood, allowing them to interact with local citizens, visit local green spaces and parks, honour fallen veterans and visit community groups and organizations who assist those in need. The Edward Murphy Spirit Quest began with an opening ceremony at the school with honoured guests Chief Top Leaf and Socio Community Police Officer Benoit Joly. Closing ceremonies took place at Hochelaga-Maisonneuve Mercier City Hall with host and borough Mayor Réal Ménard. 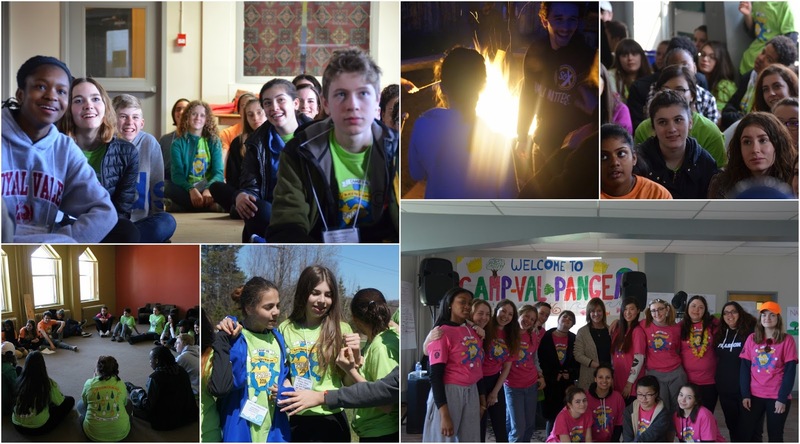 “This spiritual journey allowed them to create experiences that will aid them in developing the positive virtues and character traits that they have been learning,” added Speranza. EDWARD MURPHY’S EDIBLE ORCHARD: Thanks to a generous grant from Fondation Alcoa through Tree Canada, Edward Murphy School has planted an edible tree orchard in their schoolyard. The B.A.S.E. Daycare Green Initiative has led the greening project, and will be hosting an event on June 3 to commemorate the partnership and new outdoor learning space for the students. Come join the team on June 3 to see the new pear and apple trees, berry bushes, and edible herbs. They are thankful for the opportunity to bring edible fruit trees to our youth, and show them the value greening and growing food in their own backyards. PLAY IT FAIR: The EMSB`s B.A.S.E. Daycare Program and Spiritual Care and Community Involvement Services hosted a Supporting Children as Leaders Through Play it Fair! Celebration on May 6 at Dante Elementary School in St. Léonard. As of October 2015, some 20 Secondary IV students from Vincent Massey Collegiate have been participating in the Supporting Children as Leaders through Play it Fair! pilot program with more than 200 B.A.S.E. daycare students from Dante, Gerald McShane, Michelangelo International and Pierre Elliott Trudeau Schools. Under the mentorship of B.A.S.E. daycare educators, the VMC and B.A.S.E. 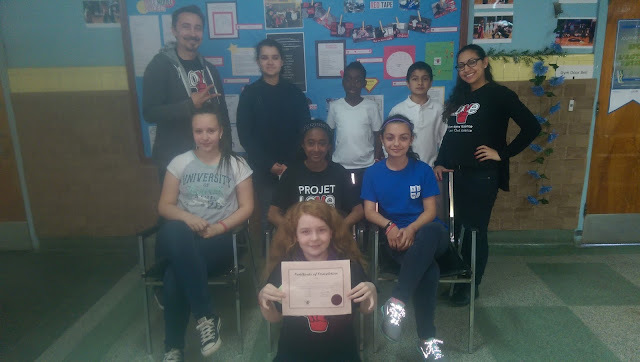 students engaged in weekly activities and group discussions around different values and created community action projects that aim to make the community a better place. This celebration is being hosted for three reasons: to highlight the collaborative environment and the relationships formed between the daycare educators, the VMC students and the B.A.S.E. students; to showcase the different community action projects; and to award the VMC students with their Play it Fair! Activity Leader Certificate. FOOD REVOLUTION: Students from three elementary schools - Parkdale in St. Laurent and Sinclair Laird and St. Raphael in Park Extension - joined their peers from General Vanier Elementary School in St. Leonard on May 20 to participate in Jamie Oliver’s Food Revolution Day. In recognition of the day, the EMSB’s B.A.S.E. Daycare Program organized a cooking showcase, which put to the test the cooking, gardening and food literacy skills taught throughout the year. Three teams of students joined forces with a noted local chef (Julia Dawson, Theo Lerikos and Massimo Piedimonte) to create a single sweet or savory dish, while incorporating a mystery ingredient. The teams then had 60 minutes to plan, prepare and cook. They were then judged on teamwork, creativity, taste and texture. Food Revolution Day is a global day of action to put food education back on the school curriculum. Created by celebrity chef Jamie Oliver, the goal of the day is to promote food education in a fun and creative way. The mission of the Jamie Oliver Food Foundation is to reverse the rise in obesity levels and diet-related disease and to equip children with the basic skills they need to lead healthier, happier lives, for themselves, and their future families. Food Revolution Day is marked by over 10,000 events in 121 countries and territories. 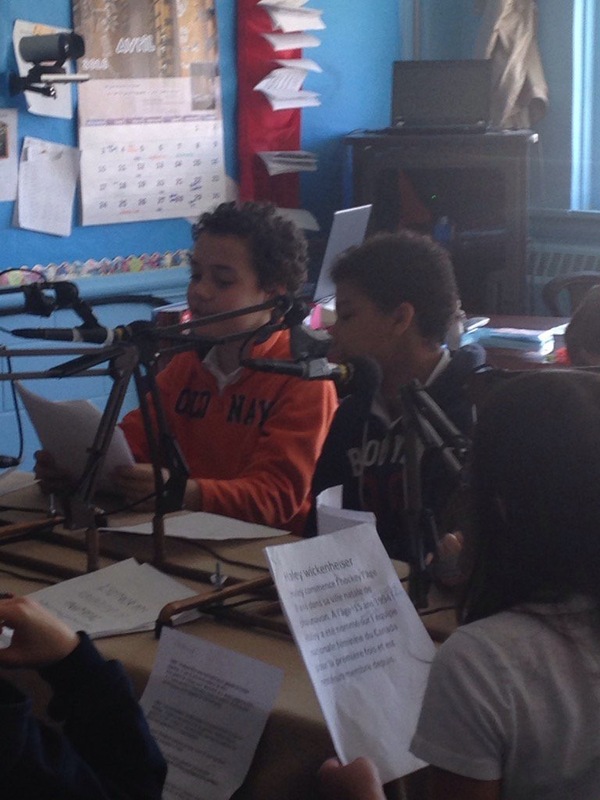 RADIO PARKDALE: An ordinary Grade 6 class at Parkdale Elementary School in St. Laurent was transformed into a radio studio recently as students delved into Canada’s favourite sport and pastime of hockey live on 102.3 FM. Produced by Mme Nancy and Mme Laetitia, their French classes began preparing for the show six weeks before the full segment that aired on April 27. This activity was made possible through A Montreal School for All (AMSFA) Grant in which teachers can access different interdisciplinary projects and activities for their students.“Their pre-show nerves were quickly replaced with excitement when it was time to get behind the microphone and report their story,” added Mme. Nancy. “We would do it again, but with a new subject,” added the students. EAST HILL CLEANUP: Kindergarten students from East Hill School spent the morning with their Spiritual and Community Animator Rocco Speranza and their teachers, learning about the 4Rs. “We must teach respect for the planet, the environment, classrooms and communities and animals,” said Speranza. 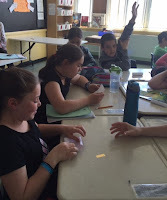 POSI BALL: At East Hill Elementary School in RDP, media teacher Alicia Di Stefano and her Grade 6 students took on a huge project in collaboration with The Learning Partnership and EMSB Pedagogical Consultant, Travis Hall. This project was a huge success and raised over $400 for Big Brothers and Big Sisters. On Wednesday, June 8, students from East Hill and Perspectives II High School will attend a ceremony at the BMO head office lobby (119 Rue St. Jacques) from 1030 am to 130 pm The students chose the POSIball project as their business venture, with support from The Learning Partnership throughout the year. POSIballs are stress balls, composed of balloons that are filled with Orbeez (water-absorbing pellets). Rather than use the term stress ball, they went for a more positive play of words, hence the term POSI-ball. They purchased the materials and created them from scratch. 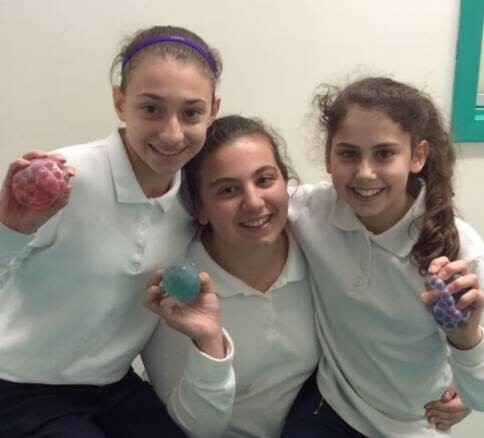 Proud of their POSIball project. For six Grade 7 entrepreneurial students, this was quite an adventure. All of the students in all three classes had to submit an idea along with a business plan to their version of the “Dragon’s Den” who in turn voted for the best idea presented. The project took a life of its own. All three classes had to collaborate together in making the selected business plan materialize. Students who initiated the business plan became the leaders and the other students received supporting roles, which they took on with just as much enthusiasm. This business venture allowed both students and staff to share in the excitement of making this business plan come alive. This entrepreneurial venture had an impact on the Principal as well, being faced with the tough challenge of requesting payback of the loan made to them in order to see their project through. It was indeed difficult not to cancel their loan. 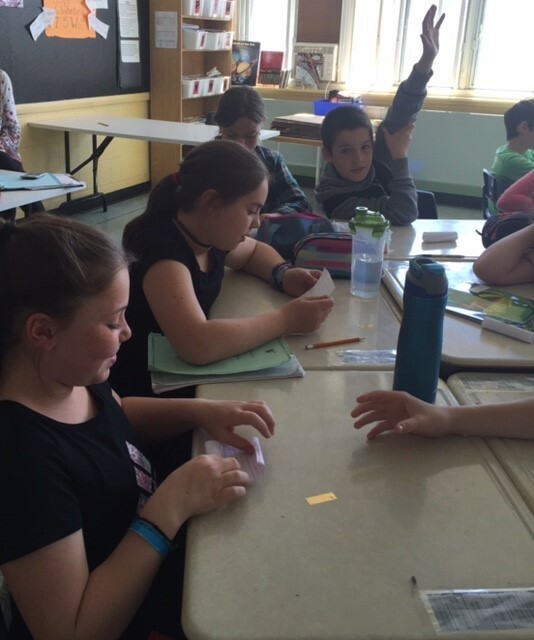 Our grade six students can be proud of their real-life business adventure. What great impact this project had on the little ones as well. They were fortunate enough to see the older students demonstrate not only their leadership skills but their organizational skills as well. Unfortunately, the younger ones also learnt a tough lesson – first come, first serve – and some were disappointed when the product sold out. HOLOCAUST EDUCATION: Students at Rosemount High School spent time recently with two Holocaust survivors: Steven Hopmann and Ted Bolgar. Students had the chance to hear their story of survival as well as learn about the Holocaust. Yom Hashoah, otherwise known as Holocaust Remembrance Day, took place on Wednesday, May 4. Camp Papillon. Facilitated by Dynamix, students participated in a variety of team building activities including an Amazing Race, relay races, laser tag and other cooperative activities. The camp was an opportunity for students in two different schools to build bridges between the youth from different communities. Taking a cue from the leadership camp, students at both schools plan to organize a Spirit Day in their respective schools. ARTIST JAYE: Over the last four years, Artist JAYE has been dedicating 65 plus hours of unpaid work per week towards mentoring and teaching music to underprivileged children. The Sharing Music Unites Us™ cause is having a solid cultural and artistic impact in our community. Artist JAYE, founder of the Sharing Music Unites Us™ cause made his latest surprise appearance at the Mateo Maw (Grade 4) and he will also be given free guitar lessons by Jaye himself. For more information about Jaye's cause, visit SharingMusicUnitesUs.com. HAMPSTEAD SCHOOL RECOGNIZED: Hampstead Elementary School was one of 14 Quebec schools to be awarded a PHE (Physical Education And Health) Canada Award for quality daily physical education. Congratulations to physical education teacher Michael Creamer, for his incredible work in delivering quality programming! “Although it is but a small part of the many things that go on in the PHE program, I know Hampstead has done some innovative programming in implementing the Build Our Kids Success morning physical activity program this year,” said EMSB Physical Education and Health consultant Katherine Baker. “In fact, the coordinator of the BOKS program has brought guests to Hampstead multiple times to have them observe the program being delivered. Hampstead purchased high jump equipment this year through the Keeping the Physical in Education grant that the board provides.” . Skateboard art at its best. SKATING MATTERS: Students from the 15+ class at James Lyng High School in St. Henri will present Skating Matters at the Up Next Gallery on May 26 from 3 to 4:30 pm and from 6 to 7:30 pm. This student-organized show will present skateboard art created by Secondary III James Lyng students in their visual arts class. 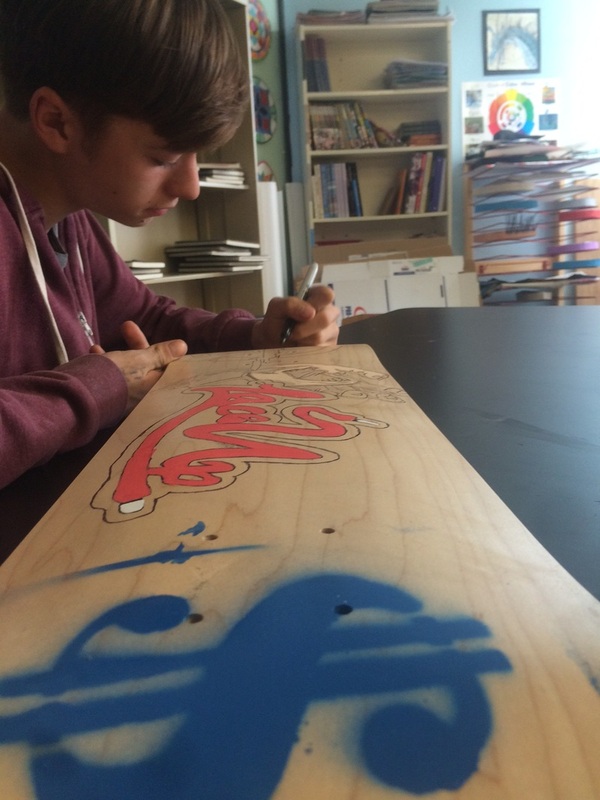 Over 50 skateboard decks will be on display at the Up Next Gallery, located in the school’s library. The skateboard decks will be for sale in order to fund next year’s Secondary III skateboard art projects. This show is meant as a statement to the borough that our community needs a skate park nearby the school for neighbourhood residents and for James Lyng students. There will be a short documentary presented which was made by the students in partnership with Oracle Productions. This documentary will be shown at 6:30pm. Many of the students who organized this skate gala and created the short film will be present at the event to answer questions. This will be the second art show produced by the 15+ class for the Up Next Gallery. These shows are done as part of the partnership between James Lyng High School, McGill University and Under Pressure International Graffiti Convention. GOLF TOURNAMENT: The annual ACRA Golf Tounament takes place on Wednesday, July 6 at Club de Golf Belle Vue in Chateaguay, Here is the flyer. BEN FAGAN HONOURED: The sixth annual Montreal Community Cares (MCC) Awards Gala honoured 17 individuals and organizations that are making a difference in our city. Created with the mission to promote and celebrate community engagement, the MCC Awards have paid tribute to some 90 Montreal community champions since 2011, and have helped build bridges among the city’s many different groups.The Gala was an evening of celebration and entertainment where local heroes, most of them ordinary citizens, receive the recognition they deserve. This year’s Montreal Community Care Award recipients included four people directly associated with the EMSB: High School of Montreal Adult Education Centre Principal Ben Fagan, who will retire at the end of the present academic year after 41 years of devoted service, was presented with the Lifetime Achievement Award; Roen Higgins, a behavior specialist at St. Monica Elementary School in NDG and Malik Shaheed, a graduate of Westmount High School and a presence in many EMSB schools via his Youth Stores group, won Community Leader Awards; and Kathy-Anne Baptiste, director of the Black Board of Educators (BBE), won a Community Organization Award. BBE is very present at St. Monica through its homework program and plans to introduce a new initiative aimed at connecting youth with seniors. Ben Fagan began his career as a teacher in 1976 with Shawbridge (now Mountainview). He moved on in 1981 to the Philip E. Layton School for the Blind, where he became principal in 1995. Two years later, he added the same title at the Mackay Centre School for the Deaf and Disabled. Fagan moved on to his current assignment, principal of the High School of Montreal Adult Centre in Plateau, in 2006. See the full press release. Principal Lino Buttino and his team. HAIRDRESSING WINNERS: Laurier Macdonald Vocational in St. Léonard won the Hairdressing competition at the 14th Quebec Skills Olympics held in Quebec City. Student Zabi Jafary was exemplary and made the Centre and School Board proud! The 14th Quebec Skills Competition and Technology took place on May 5 and 6 in Quebec City, allowing 234 competitors to show off their talents. For some, the adventure continues with the Canadian Olympics, but all will leave with the pride of defending excellence in their craft. At the end of the competition, 100 participants came away with a medal. The highest award, the "Best of Quebec," went to Patrick Martel, gold medalist in consultative sales. From the vocational training center of residents, the young man got the highest score in all disciplines. This award comes with a cash prize of $ 2,500 offered by Compétences Québec . Finally, another 23 were awarded a medallion of excellence. This distinction is granted to competitors whose final result is above average in their respective fields. Teacher Yves Momperpousse and student Michael Toje Salvador. Despite feeling tired and weak throughout his life, at 23-years-old, Michael, was accustomed to the symptoms and did not believe they were any cause for concern. Unbeknownst to him, the problem was approaching a critical stage. If left untreated, it would have resulted in his death within a matter of months. Days after the physical examination, Michael was in the care of doctors at the Royal Victoria Hospital. Yet, the procedure was anything but routine. After undergoing surgery to fix his Aortic valve, he began to bleed internally, to which a second surgery was required. “If it was not for the Shadd Health and Business Centre, my only son would have been dead,” said Michael’s mother. 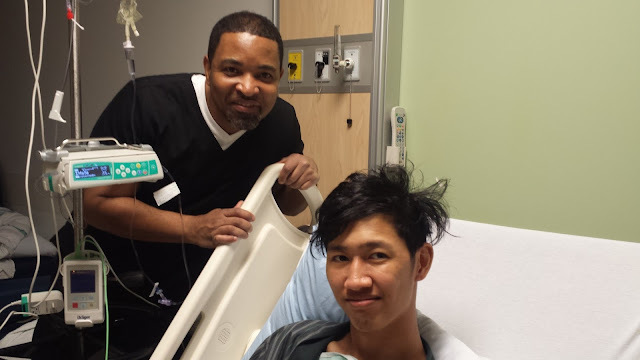 “This physical examination found his heart condition and this school saved his life.” After a number of days in the hospital, the first of which were spent in the Intensive Care Unit, Michael is recovering well. Once he receives clearance from his physician, he will return as a full-time student at the Shadd Health and Business Centre. The Wicked Witch in action. QUEBEC CITY VISIT: Galileo Adult Centre students from the CCBE and Academic programs embarked on a walking tour of Vieux Quebec City recently. CCBE students learning English as a second language were able to practice their communication skills with merchants as well as tourists visiting Quebec City from abroad. The historic attractions such as; the Plaines of Abraham, Ramparts (fortified city walls), Chateau Frontenac, the Quebec Parliament and Montmorency Park provided the perfect picturesque background not only to bring our province’s past to life for our new citizens and recent arrivals, but also for our academic students who toured the cobblestone streets, where the history they are studying, was made. Mme Mancini souligne que défaire le projet de loi 86 a été un effort d’équipe. Avant tout, cet exercice a résulté en une expérience de rapprochement entre les commissions scolaires francophones et anglophones à travers la province. À la CSEM, Mme Mancini désire remercier les représentants syndicaux, les associations administratives et leurs membres, le comité consultatif des élèves de la CSEM, le Comité central de parents, les conseils d’établissement et quelques leaders municipaux qui se sont exprimés clairement et fortement sur cette question. « J’exprime ma gratitude au conseil des commissaires pour son appui contre le projet de loi 86 et des remerciements spéciaux à notre vice-présidente Sylvia Lo Bianco pour ses efforts inlassables au cours de l’année écoulée ainsi qu’au commissaire Joe Ortona qui a présenté avec nous notre mémoire à la Commission parlementaire à Québec. Lorsque le projet de loi 86 a été déposé par l’ancien ministre de l’Éducation, François Blais, en décembre dernier, plusieurs personnes nous ont dit que nous n’avions aucune chance à combattre ce projet de loi - que c’était un fait accompli. Nous n’avons jamais eu une attitude défaitiste. » Voir notre communiqué de presse détaillé. • Que la Cour considère que la prépondérance des inconvénients penche en faveur de la Commission parce que si l’ordonnance de sauvegarde avait été accordée, 26 parents auraient empêché de voter au Comité central de parents. CAMP DE BLUES: Des élèves de l’école Royal Vale, Jordan Kadanoff (trombone) et Ji Han Lee (piano) qui font partie de la classe de Jazz de Jana Jast, ont été accepté à participer au Camp de Blues de cet été après avoir passé une audition. Ils seront placés dans un orchestre et recevront gratuitement une semaine de camp musical d’été par des professionnels et, à la fin, ils se produiront au Festival international de jazz de Montréal, le samedi 9 juillet (18 h) sur la scène principale de la TD. Félicitations à ces élèves qui sont les premiers à avoir jamais représenté l’école Royal Vale en musique au Festival international de jazz de Montréal. JOURNÉE NATIONALE DES ENSEIGNANTS: À l’occasion de la Journée nationale des enseignants qui a eu lieu le 3 mai dernier, la CSEM a reconnu deux enseignantes qui ont reçu des prix spéciaux du restaurant P. F. Chang tandis que la Cage Brasserie Sportive a remis un prix à un enseignant d’éducation physique et à la santé. La cérémonie a eu lieu à l’école primaire St. Monica de NDG, City’s Breakfast TV était présente et a offert une couverture exceptionnelle (https://vimeo.com/165294946. Christopher Hawkins, un gérant du restaurant P. F. Chang, situé Rue des Jockeys (boulevard Décarie et Jean Talon) a remis à l’enseignante de St. Monica, Nancy Girard et à l’enseignante du programme d’aide technique en pharmacie du Centre d’études commerciales et de Santé Shadd, Geneviève Kona-Mancini des certificats cadeau de 100 $ pour ce restaurant très populaire, connu dans le monde entier pour sa fantastique cuisine asiatique. Stéphane Fortin, enseignant d’éducation physique à Elizabeth Ballantyne recevra une carte cadeau de 100 $ pour la Cage Brasserie Sportive. Les boxeurs professionnels Ulysse Junior et David Théroux, ambassadeurs pour la Cage, ont présenté ce prix en présence du commissaire de la CSEM, Joseph Lalla. RETRAITÉS AU CENTRE ADMINISTRATIF: Sept personnes qui travaillent au centre administratif de la CSEM prendront leur retraite. Ce sont : Aline Zerounian, traductrice, (après 52 années de service), Dora Cesta, directrice adjointe des Services aux élèves, Nicole Orsali-Bernard, l’agente de la division de l’immobilier, Kathy Yates, l’agente des Services éducatifs et de la technologie, Lorraine Moreault, technicienne en administration du Service des ressources matérielles, Debbie Lancaster des Services financiers et Maria Santeusanio de la division des inscriptions. LEADERSHIP: Un total de 215 élèves d’à travers le réseau d’écoles secondaires de la CSEM sont retournés du 18e camp annuel de leadership de la Commission, tenu à Camp Val-Estrie à Waterville, Québec. Le thème de cette année a été Pangea - tel que le continent primordial, nous pouvons tous nous réunir pour former quelque chose de puissant et d’efficace. Des élèves du secondaire I au secondaire V ont participé à la retraite et provenaient des écoles secondaires, James Lyng, John F. Kennedy, John Paul I, Laurier Macdonald, Lester B. Pearson, Rosemont, Royal Vale, Westmount, l’Académie LaurenHill, l’Académie internationale Marymount, l’Académie Royal West et le Collège Vincent Massey. AIDER FORT McMURRAY: Dollar pour dollar, Genia Palechka, une élève de 10e année à l’école secondaire Macdonald, tente de faire une différence. En vue des incendies récents qui ont détruit Fort McMurray et laissé des milliers de personnes sans abri, Genia a commencé une campagne de financement participatif avec le but immédiat d’aider les personnes affectées et l’objectif à long terme d’inspirer ses pairs de commencer à agir sur des sujets globaux et communs. « J’aimerais aider les résidents de Fort McMurray en ce moment difficile déclare Genia. Un grand nombre de personnes ne prennent pas d’initiative sur ces questions. J’aimerais inspirer les jeunes à le faire. J’aimerais que les jeunes réalisent qu’ils peuvent sensibiliser le monde sur n’importe quel sujet, quel que soit leur âge. À ce jour, la campagne de Genia a levé 195 $ en dons de la communauté de Laurier Macdonald. https://www.gofundme.com/22z7hys. Tous les fonds recueillis seront remis à la Croix rouge canadienne. Les 70 cartes de souhaits de diverses tailles - qui ont été produites par un nombre de groupes de tout l’effectif scolaire - ont été présentées aux jeunes réfugiés par deux élèves de 6e année, Victoria Lee et Colin Pasian-Rozahegy. Colin a parlé au groupe de la vie au Canada et des diverses origines multiculturelles des élèves tandis que Victoria a raconté qu’elle était arrivée au Canada à l’âge de 8 ans de la Corée du Sud, ne sachant pas parler le français ni l’anglais, et les a assuré que le Canada est un lieu sécuritaire où il fait bon vivre. RÉCEPTION EN L’HONNEUR DES LONGUES ANNÉES DE SERVICE: Près de 82 personnes étaient présentes à la réception tenue en l’honneur des longues années de service, qui a eu lieu le 10 mai au Challenger à Ville Saint-Laurent. La CSEM a honoré 36 employés - enseignants, administrateurs et personnel de soutien - pour leurs 25 années de service à la Commission, débutant en 1991. La présidente de la CSEM, Angela Mancini, la Directrice générale, Ann Marie Matheson, le Directeur général adjoint, Angelo Marino, avec plusieurs commissaires, administrateurs scolaires et les directions des bureaux régionaux, organisation scolaire et service de l’éducation des adultes et de la formation professionnelle, le centre administratif, les Services aux élèves, le Service des ressources matérielles et le Service des ressources humaines ont présenté aux employés honorés une montre Monarch, comme geste de leur appréciation. Les personnes honorées étaient les suivantes : Evelyn Alfonsi (Directrice régionale); Donald Allen (Agent de la sécurité, Ressources matérielles); Georgette Amar et Santina Miceli (Centre de l’éducation des adultes Galileo); Mario Argiropoulos, Daniela Borzacchini, Hariett Cohen et Naomi Goltzman (Service de l’éducation des adultes et de la formation professionnelle); Marysa Barasi, Suzanne Lanthier et Angela Soda-Bozzer (Centre de l’éducation des adultes Saint-Laurent); Metaxia Daras-Tsopeis (École Carlyle); Miria Fent et Nicole Mahoney (Centre de l’éducation des adultes John F. Kennedy); Christiane Gagné et Elizabeth Gluch (Centre de l’éducation des adultes Marymount); Nicoletta Gouskos (Ressources humaines); Nick Katalifos (École Roslyn); Jeanine Lason (Organisation scolaire); Joanne Lipscombe, Iliana Panova et John Vaccarella (Centre de l’éducation des adultes du High School of Montreal); Brigitte Martin (École Honoré Mercier); Gina Milazzo (École Général Vanier); Eddy Nolan (École Mountainview); Pasquale Pietrantonio (École Options); et Lori Rubin (Services aux élèves). HOMMAGE AUX RETRAITÉS: Le centre administratif de la CSEM a tenu sa levée de fonds annuelle de la journée du Denim pour la recherche sur le cancer du sein en reconnaissant plusieurs employés qui prennent leur retraite : la traductrice, Aline Zerounian, la directrice adjointe des Services aux élèves, Dora Cesta, Nicole Orsali-Bernard de la division de l’immobilier. Kathy Yates des Services éducatifs et de la technologie, Lorraine Moreault du Service des ressources matérielles et Maria Santeusanio de la division des inscriptions. Debbie Lancaster des Services financiers n’a pas pu être présente. La directrice générale de la CSEM, Ann Marie Matheson, a présenté un bouquet de fleurs à chaque dame. Mme Zerounian qui a travaillé pour l’ancienne CEPGM et la CSEM pendant 52 ans et Mme Cesta ont parlé de l’importance de soutenir la recherche sur le cancer du sein. BEN FAGAN HONORÉ: Le prix du 6e Gala annuel des Méritas de la Fondation Montréal à Cœur (FCM) ont honoré 17 personnes et organismes qui font une différence dans notre ville. La mission de Montréal à Cœur est de promouvoir et de célébrer l’engagement communautaire. Cette année, les prix Montréal à Cœur, ont inclus quatre personnes directement impliquées avec la CSEM. Le directeur du Centre de l’éducation des adultes du High School of Montreal, Ben Fagan, qui prendra sa retraite à la fin de l’année scolaire courante après 41 années de services dévoués, a reçu le prix de contribution exceptionnelle; Roen Higgins, un spécialiste en comportement à l’école primaire St. Monica et Malik Shaheed, un diplômé de l’école secondaire Westmount et une présence dans plusieurs écoles de la CSEM, par le biais de son groupe, Youth Stores, ont remporté le prix de Leader communautaire et Kathy-Anne Baptiste, directrice du Black Board of Educators (BBE) a remporté un prix d’organisation communautaires. BBE est très présent à St. Monica par le biais de son programme de devoirs et a l’intention d’introduire une nouvelle initiative visant à relier les jeunes aux aînés. Ben Fagan a reçu son baccalauréat en sociologie du Collège Loyola en 1970. Il a travaillé au début pour les Services pour les familles et enfants catholiques aidant les chômeurs de Pointe Saint-Charles à s’adresser aux agences gouvernementales. En octobre 1972, il a déménagé en Irlande pour continuer sa maîtrise et a travaillé pendant deux ans à temps partiel avec les jeunes désœuvrés de Dublin. En 1977, l’ancienne Commission des écoles protestantes du Grand Montréal (CEPGM) a pris en charge l’école et Fagan est devenu employé de la Commission. Il est demeuré à Shawbridge jusqu’en 1981. L’école se nomme actuellement Mountainview et elle est située sur le Chemin de la Côte Saint-Luc. En 1981, il a été affecté à titre d’enseignant à l’école Philip E. Layton et nommé directeur de l’école en 1995. Deux ans plus tard, il a assumé le même poste à l’école du Centre Mackay pour sourds et handicapés. Fagan a été transféré au poste de directeur du Centre d’éducation des adultes du High School of Montreal en 2006. « Durant ces années, j’ai été impliqué aussi à du bénévolat. J’ai siégé aux conseils du Centre Mackay, du Centre de réhabilitation Lethbridge, de Propulsion – une organisation pour les handicapés physiques- et l’Institut canadien de recherche et de formation sur la surdité. Plus récemment, j’ai terminé une implication de 16 ans à titre de président des Habitations adaptées et accessibles Tango, dont j’ai été un des fondateurs en 1999. Le gala de cette année était animé par Lori Graham de CTV Montreal et Derek Aucoin de TVA Sports. Il a eu lieu au Centre Eric Maclean de l’école secondaire Loyola de NDG. LAURÉATES DE COIFFURE: Le Centre de formation professionnelle de Laurier Macdonald a remporté le concours de coiffure aux 14e Olympiades des habiletés du Québec. L’élève Zabi Jaffary a été exemplaire et le Centre et la Commission en sont très fiers. Le 14e concours d’habiletés et de technologie a eu lieu les 5 et 6 mai à Québec, permettant à 234 concurrents de démontrer leurs talents. Pour certains, l’aventure se poursuit avec les Olympiades canadiennes mais tous quittent avec la fierté d’avoir défendu l’excellence de leur métier. À la fin du concours, 100 participants ont remporté une médaille. Le prix le plus important « Le Meilleur du Québec » a été décerné à Patrick Martel, conseiller en ventes, médaillé d’or, qui a obtenu le plus haut score dans toutes les disciplines. Le prix est accompagné d’un chèque de 2,500 $ offert par Compétences Québec. Finalement, 23 autres participants ont reçu un médaillon d’excellence .Cette distinction est décernée aux concurrents dont le résultat final est au-dessus de la moyenne dans leurs domaines respectifs. Bien qu’il se sentait fatigué et faible, Michael, 23 ans, était habitué à ces symptômes et ne pensait pas qu’il devait s’en préoccuper. Ce qu’il ne réalisait pas, c’est que le problème avait atteint un stage critique. S’il n’avait pas été soigné, il serait mort d’ici quelques mois. Quelques jours, après l’examen médical, Michael était aux soins de médecins de l’Hôpital Royal Victoria. Néanmoins, cette procédure n’avait rien de routine. Suite à l’opération de la valve aortique, Michael a développé une hémorragie interne, et une deuxième chirurgie s’avéra nécessaire. « Si ce n’était pas le Centre de santé et d’études commerciales Shadd, mon seul fils aurait été mort » déclara la mère de Michael. « Cet examen médical a trouvé le problème de son cœur et c’est cette école qui a sauvé sa vie. » Après quelques jours à l’hôpital, dont les premiers jours étaient aux soins intensifs, Michael, commence à récupérer. Dès qu’il recevra son congé du médecin, il compte retourner come élève à temps plein au Centre de santé et d’études commerciales Shadd.